Caroline Pam and Tim Waite with some of Kitchen Garden Farm’s products, now sold across the country. Caroline Pam gave the jar a half-turn. That was how she started to answer a question, the one about what makes her company’s salsa and sriracha (hot sauce) stand out in a market crowded with competitors. The answer, or at least a big part of it, was to be found on the back side of the jar in front of her, the one containing Kitchen Garden Farm’s ghost pepper sriracha, made from a blend of ghost peppers, red chilies, and habanero peppers — the one with the words ‘super hot’ and a small skull and crossbones on the front. 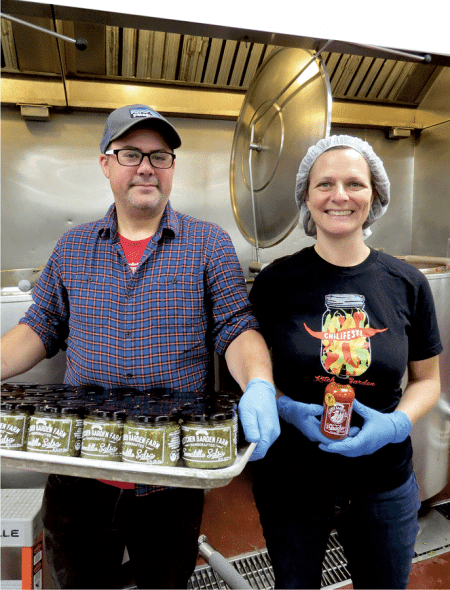 Those words on the back — “Our sauces are hand-crafted from organic peppers grown on our family farm” — resonate with many constituencies, said Pam, co-owner of Sunderland-based Kitchen Garden Farm along with her husband, Tim Wilcox. And that helps explain why the product is now sold across the country. What it doesn’t say on the label, although this is also an important part of the company’s progress to date, is that these salsas and srirachas are produced and packaged at the Western MA Food Processing Center (WMFPC) in Greenfield, a facility that has helped spawn a number of food labels — and business success stories. Tucked away in an industrially zoned area about a mile from Greenfield’s Main Street, the food-processing center was launched in 2001. It was an ambitious undertaking and a response to a request from the state for a facility to help its agriculture industry and entrepreneurs within the very broad realm of food and beverage take concepts from their farms, family recipe books, and even the proverbial back of a napkin and turn them into business enterprises. That response came from the Franklin County Community Development Corp., said its executive director, John Waite. 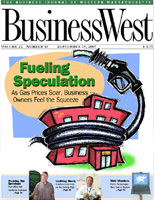 He told BusinessWest the agency cobbled together more than $800,000 from various sources to create the commercial kitchen and adjoining warehouse and distribution facilities. Over the years, more than 350 clients, by Waite’s count, have made their way down Wells Street to the center, and collectively they have registered varied amounts of success. Some didn’t find much of it for various reasons, he said, noting that there’s nothing easy about turning a food or beverage product into a business. But many have, and it has come in different ways. Some have been using the facilities for years to bring a value-added product, or several, to the marketplace and scale up, sometimes in a big way. Kitchen Garden Farms falls in that category — Pam said the food processing center enabled the farm to go from making 400 bottles a year at a small commercial kitchen it was renting five years ago to 19,000 last year — as does Herrell’s Ice Cream in Northampton, which contracts with the center to produce its popular hot fudge sauce for retail sales. And then, there are those who have done so well, they’ve ‘outgrown’ the center, if you will, and created their own production centers. Topping that list would be Real Pickles, the venture launched by Dan Rosenberg, who started selling batches of organic dill pickles to a few dozen local stores in 2001. He came to the food processing center the following season and started producing value-added products such as organic sauerkraut and ginger carrots and expanding sales across the region. That venture did outgrow the WMFPC and moved into its own facility — right down the street, actually — in 2009. There’s also Hillside Pizza, which also started in 2001, using the center to produce small pizzas used in various fund-raising initiatives. Today, it has three locations, in Bernardston, Hadley, and South Deerfield. 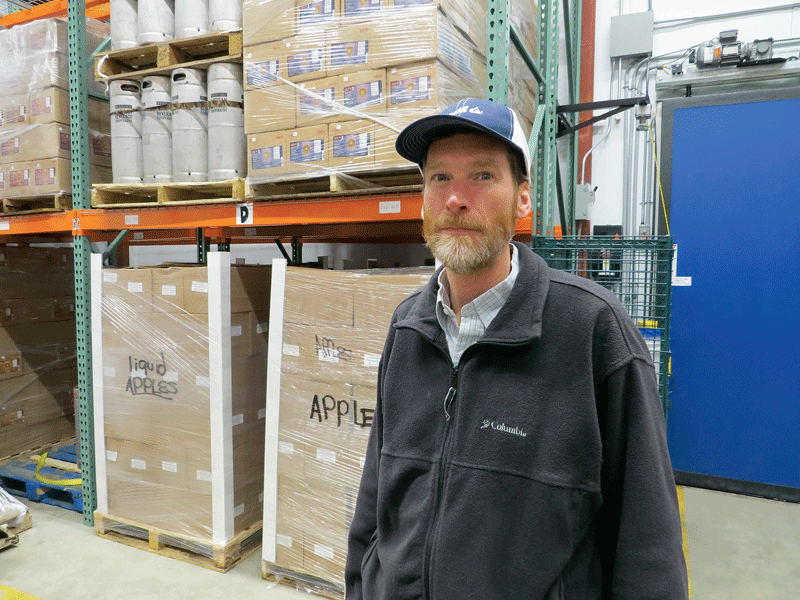 John Waite says the WMFPC supplies pots, pans, and freezer space — but also the many kinds of technical support needed to help entrepreneurs convert food and beverage products into businesses. Hillside now employs more than 40 people at those locations, said Waite, adding that this number contributes to a larger one — more than 100 by his count — when it comes to the number of jobs created directly or indirectly by the food-processing center, perhaps the best measure of its success, although there are many. 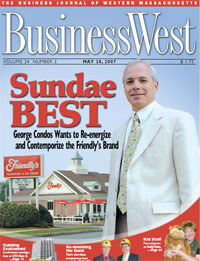 For this issue and its focus on entrepreneurship, BusinessWest paid an extended visit to the food processing center to get, well, a taste of how this unique facility has become a force in efforts to foster entrepreneurship, create jobs, sustain local agriculture, and, yes, put some intriguing products on the dinner table. When Liz Buxton tells someone she’s chief cook and bottle washer, she’s not just summoning that battle-worn phrase to describe someone who wears a lot of hats. She is the chief cook — at least for much of the work that is contracted out to the food processing center — and she also washes bottles on occasion. She also drives the fork truck regularly. And she monitors and repairs equipment. And … well, you get the idea. 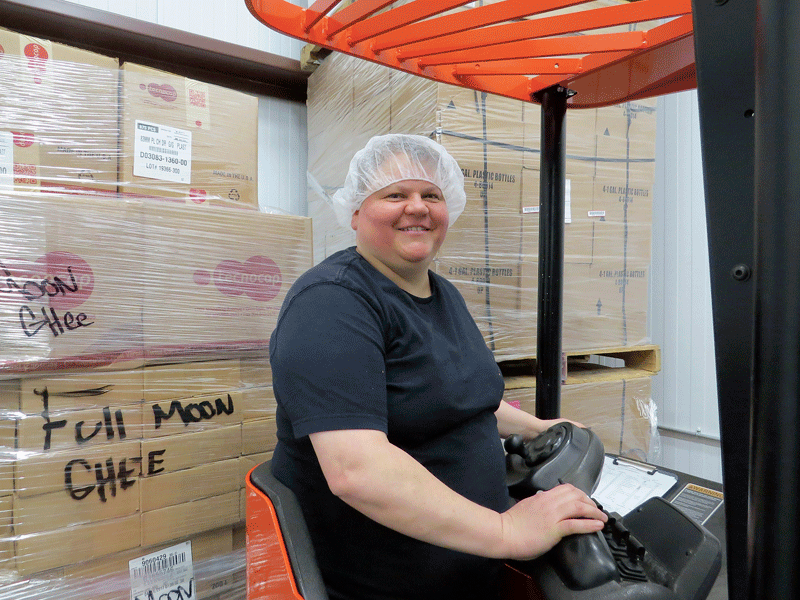 As director of operations, she really does wear a lot of hats — although mostly she’s in a hairnet, an important part of the dress code at the facility. And her presence at the center — as well as all those hats she wears — drives home the point that this facility is much, much more than a large, well-appointed kitchen. Indeed, the center is a resource; it exists not to help clients create a large batch of barbecue sauce, jam, salsa or cider, or just to do that. No, it exists to help those clients succeed in business. This is pretty much what the Mass. Department of Agriculture had in mind when it issued a request for proposals for what it called a ‘commercial kitchen’ at the start of this century, said Waite, adding that the Franklin Country CDC, in submitting its bid, thought such a facility would be a natural extension of what it was already doing, as well as a means to directly support what was, and still is, a big part of the Franklin County economy — agriculture. Joanna Benoit says scaling up — taking a family recipe, for example, and turning it into a product and a business — is an involved process for which entrepreneurs need many forms of support. But the name Western MA Food Processing Center was chosen to reinforce the fact this is, indeed, a regional facility, he went on, adding that there have been several clients from Berkshire and Hampshire counties as well, and even a few from more-urban Hampden County, although not as many as he would like. Meanwhile, some clients drive across the state to reach Greenfield, and still others arrive sporting license plates from Connecticut, Vermont, and New Hampshire. The facility meets federal, state, and local standards, and is well stocked with modern equipment, including two 100-gallon and three 40-gallon steam kettles; automated hot-bottling and filling; large-capacity mixers, choppers, and shredders; dry, cold, and frozen storage; a vegetable wash, prep, and blanching area; a quick-freeze production line; vacuum sealers; shared office space and equipment; 24-hour secure access; and more. 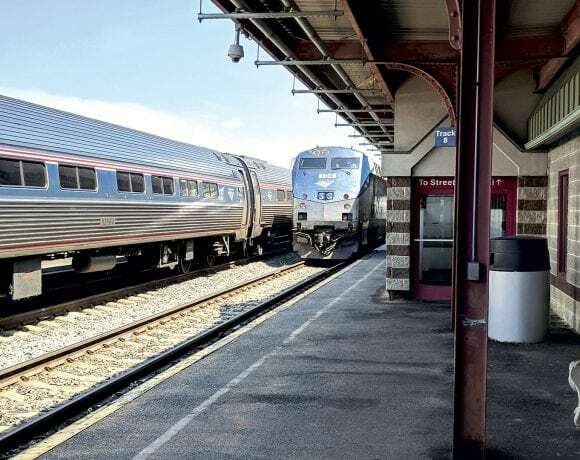 But these are only the tools of the trade, said Waite, adding that the center also provides other forms of support, especially all-important help with scaling up and taking a product across the region or even across the country. “In the beginning, we were going to teach people how to use the equipment and have an FDA-certified kitchen,” he explained. “They would come in with their own recipe — they knew what they were doing, we assumed — and we would teach them. And we still have some people doing that. Still, despite these adjustments the center made, it wasn’t seeing many of the region’s farmers it hoped would use the facility to make products like tomato sauce, for example, from their tomato crops. “They said, basically, ‘we’re not cooks, we’re farmers; we don’t want to be in the kitchen,’” said Waite, adding that these sentiments inspired those at the WMFPC to add co-packing solutions to its portfolio of services and have hired staff make those products for the farmers who want to devote their time to the fields. And many businesses, such as the aforementioned Herrell’s, have taken advantage of those services, he went on, adding that, through this work, the center became quite adept at all aspects of food production. This know-how is then passed on to the many clients, like Kitchen Garden Farm and countless others, who travel to the center, rent its facilities for $45 per hour, and handle their own production, said Waite, adding that, as a business venture itself, the WMFPC continues to grow and evolve. And, thanks to the addition of an $800,000, 2,800-square-foot cold-storage facility last December, the center should succeed with something it has struggled to do — break even on the bottom line, said Waite. The new storage space will eventually become a solid revenue stream, he went on, adding, for example, that area farmers can now use it as a meat warehouse, rather than traveling to facilities in Westfield, Chicopee, and New York. When Liz Buxton says she’s chief cook and bottle washer at the WMFPC, she means it. Yes, she also drives the fork truck on occasion. Indeed, he probably did that at least a half dozen times, partially in an effort not to overlook anyone, but also because there are so many of these stories it’s easy to lose track — until you see that bottle on the shelf. • Saw Mill Site Farm, makers of horseradish products, which is still using the WMFPC a dozen years after starting there. These ventures, which offer some good insight into the very wide variety of products processed at the center, are at various stages in their development, said Waite, but the common thread is that the WMFPC has been an important partner in whatever success they’ve enjoyed and will enjoy down the road. And as a partner, again, it provides more than those 100-gallon steam kettles. 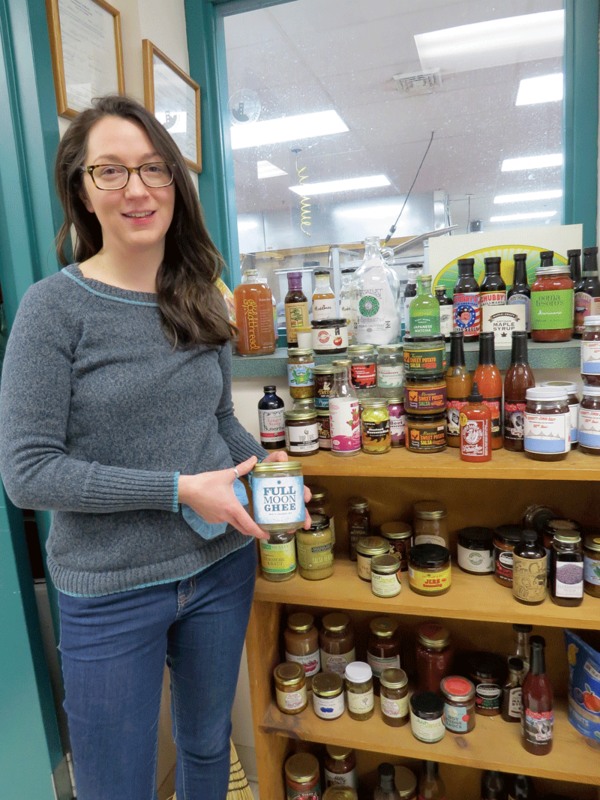 And some entrepreneurial spirit, said Joanna Benoit, Food Business Development specialist for the WMFPC, who also wears a number of hats. Indeed, much if her time is spent managing the ambitious Pioneer Valley Vegetables program, whereby the center processes fruits and vegetables from a number of local farms for sale to a number of clients, including area schools. But she also helps onboard new clients to the center, assisting them with everything from business-plan creation to marketing to scaling up a product from what is often family-kitchen scope to commercial scale. And there is a lot that goes into this process. Elaborating, she said there is much more that goes into it than taking the ingredients from a family and multiplying the amounts for each by 10, 100, or 1,000. It’s not that simple. There are all those other considerations, such as labeling, marketing, branding, and distribution, but there are also the many factors in scaling up that recipe. And that’s where Buxton, chief cook and bottle washer, comes in. She had spent more than 30 years in the food-service business before coming to the WMFPC, and took an intriguing path to employment there. Indeed, she was working as food and nutrition director for a local school district, and became introduced to the WMFPC when that district started buying produce from it through Pioneer Valley Vegetables. “When this job came open, I was very interested in it,” she recalled, adding that there was a lot to like, especially the opportunity to use her vast experience to help clients reach whatever goals they have set for themselves — and support local agriculture at the same time. No two days are alike, she told BusnessWest, adding that she works with clients to help them meet FDA and labeling regulations, find the right pH level to maintain proper shelf life without the use of preservatives, and more. “Many of these things are very hard to do without guidance,” she said, adding that the ongoing work of helping clients navigate what can sometimes feel like whitewater is rewarding on a number of levels. Pam told BusinessWest that Kitchen Garden Farm has a number of ambitious goals for the future. And one of them is to join that list of distinguished clients who have actually outgrown the WMFPV and created their own commercial processing center. She doesn’t know exactly when that will happen — 2019 is the goal — but she’s confident that it will. Meanwhile, one thing she does know is that the food-processing center has played a pivotal role in the farm’s profound growth, brand building, and ability to sell its products on both coasts and countless places in between. As noted many times earlier, and in many ways, there have been a number of success stories like this written over the past 18 years, and the best news is that there still many more waiting to be penned. That’s because the WMFPV provides its clients with all the other ingredients they need to thrive.